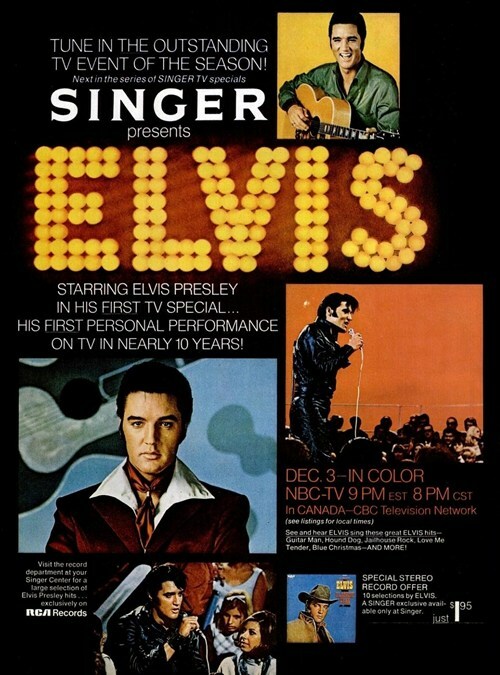 How lucky in life would you be to get to the recording of Elvis' 68 TV Special and also make it to the recent 40th Anniversary screening in L.A? EIN's correspondent Joan Gansky is one of those few very fortunate fans. Joan Gansky not only met with Elvis multiple times - but being at the original NBC recording of the 68 Special truly changed her life! Here are her unique recollections of attending the recent 40th Anniversary celebration. ALL 2008 IMAGES & Photographs by Paul Gansky. 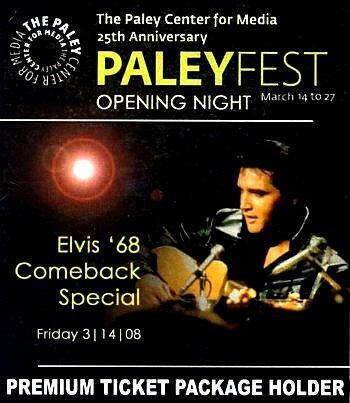 We have been members of the Paley Center (formerly Museum of TV & Radio) for about 12 years. Therefore, we received prior information and access to 2 tickets for this event and perks including admission to the special After Party. The VIP special package meant we were escorted into the theater like VIPs and were seated in the second row perfect for viewing the film and being very close to the panel members. 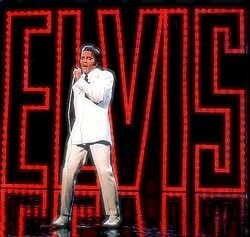 Elvis looking his very '68 best on the BIG SCREEN. Being at the original NBC recording was a true highlight of my LIFE! So watching it again on the BIG SCREEN after all these years - especially the "If I can Dream" conclusion - was incredible......the emotion poured out from the huge screen that took my breath away - in a way I had not experienced when watching it on DVD. Either Steve Binder or Bones Howe pointed out that Elvis' recording of "If I can Dream" was recorded with Elvis in a dark, empty studio PERFORMING the song... like he was on stage... and Elvis dropped to his knees in intense emotion when making that recording. No wonder it still has so much impact 40 years on! After the showing everyone was emotionally drained, however everyone was still looking forward to the promised Q&A session. On the panel sat Priscilla, Steve Binder ('68 Producer & Director) and Bones Howe ('68 Musical Producer). Left of Priscilla sat the moderator Jann Carl who is a media personality and 'Entertainment Tonight' reporter - she introduced the panel and asked them several questions, followed by questions from the audience. Priscilla spoke very complimentary on Elvis' incredible dedication to the '68 Special, and how he was so determined to move on from the movies that he had grown to dislike doing. She said the '68 Special was the reason he changed his career - from making movies - returning to Vegas and live performances, which in turn led to his touring again. Of course there was nothing really new in what Priscilla said .... but it was so heartwarming that she is saying positive things about his music career. I had hoped she would say something more "lovingly" from her own personal thoughts, too but she didn't! An audience question to Priscilla was if she was at the filming of the '68 Special. Priscilla said "Yes"...and mentioned was that it had been a long time since she had watched this Special, and that night, she noticed herself in the back (row?) of one of the scenes in it. At one point Priscilla asked the audience if they had seen the episode on "American Idol" last year, where they used "If I can Dream" sung by Elvis with Celine Dion?...Priscilla seemed very moved by it and said she thought it was really fantastic, and, of course, the audience agreed - with loud applause and cheering! Later we found out that Lisa Marie was in fact backstage with her hubby! I recall Priscilla mentioning that they were all thrilled at the prospect of a new baby in the family. Priscilla and Lisa had a brief photo session in the lobby, probably as we all were watching the '68 Special screening. Another audience question was regarding "MacArthur Park". Steve Binder replied that he had asked Elvis if he would have recorded it (if it had been offered to him) seemingly to get a feel if Elvis was willing to sing "modern" / upto date type songs. And Elvis said he WOULD HAVE! 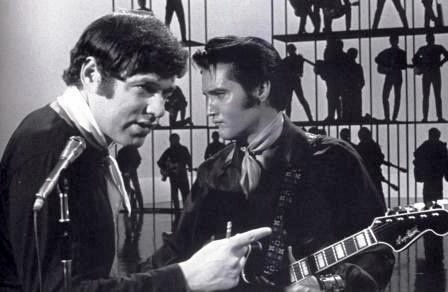 Steve felt that Elvis was "sending a little message to him personally" recalling their earlier conversation - when he started singing a line or two of the song during the taping - like it was an "inside" joke! 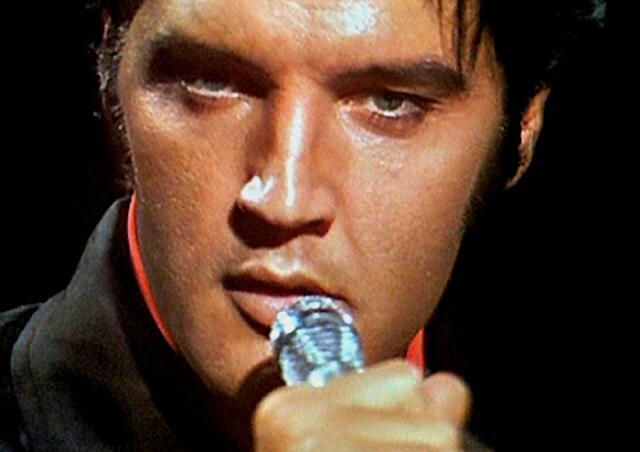 I am not sure if it was Steve or Priscilla who answered a question about Elvis repeating the words "My Boy, My Boy". This was also a "catch phrase" that Elvis and the guys around him were using at that time...so, again, it was an inside joke for their "group". Steve Binder did most of the talking! There was not much new in addition to what he has said in interviews in the past. He talked about Elvis being very nervous (as did Priscilla) and how he had to insist that Elvis go out on stage when Elvis almost backed away at the last minute! He also mentioned that Elvis was actually staying overnight at NBC - sleeping there rather than going home. 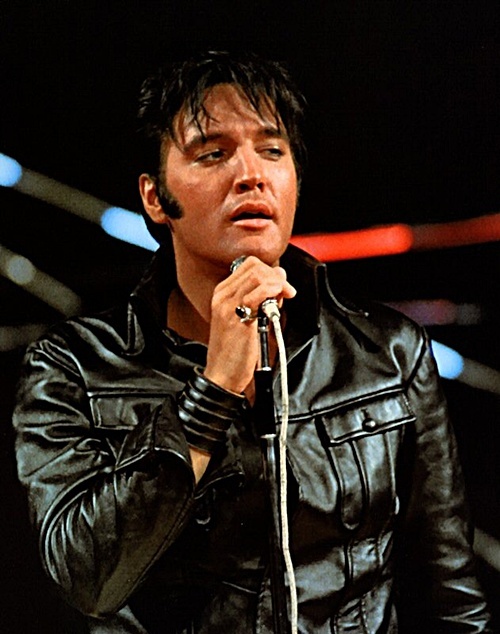 One thing he said I had not heard before was that The Beatles phoned Elvis while he was at the studio but Elvis did not take their call, as he did not want to be interrupted by phone calls from anyone! He was totally engrossed in the show only. 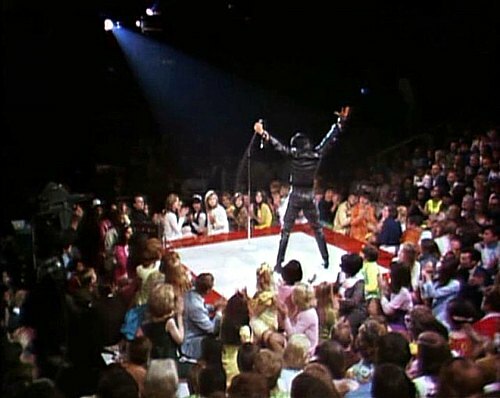 Binder recalled that the Col had ALL the tickets at his disposal and had said only he would have ways of getting them out to Elvis fans all over the country. However The Col. did not do as he had said he would, and they were all frantically running around looking for people to give the tickets to, in order to fill the seats at the last minute! This is a fun and often repeated story however since I was there I don't think that it can be totally correct. I for instance had my 2 tickets arrive in the US Mail! In fact I had returned to England to decide if I would stay there with my family or return to the USA. I wonder how many people made life-changing decisions involving the 68 Special! Also a number of the "gate people" - the fans who waited at Elvis' gates constantly to chat with him as he came and left, received tickets to the '68 Special from Elvis personally! Looking at the '68 Special footage it certainly doesn't seem that the audience were "dragged in off the streets and hamburger restaurant nearby" - as they looked pretty much dressed up for the occasion. Bones interestingly seemed to have a little different recollection to the events at the Burbank Studios regarding the audience. His recollections were that there were hundreds of people lined up in the parking lot at NBC. But he said they came because they had heard Elvis was there recording the show - and were there just in hopes of seeing him. MY recollection is, yes, we were there standing in line to get in, but we all had tickets! My friend and I arrived in plenty of time..and were close to the front of the line... people took it in turns to go across the street to a Hamburger place to get drinks etc. We were among the first to be let in, and grabbed the first two seats we could. We were asked by a couple of "stage-hands" to move down and sit on the stage...but sad to say, we didn't do so. 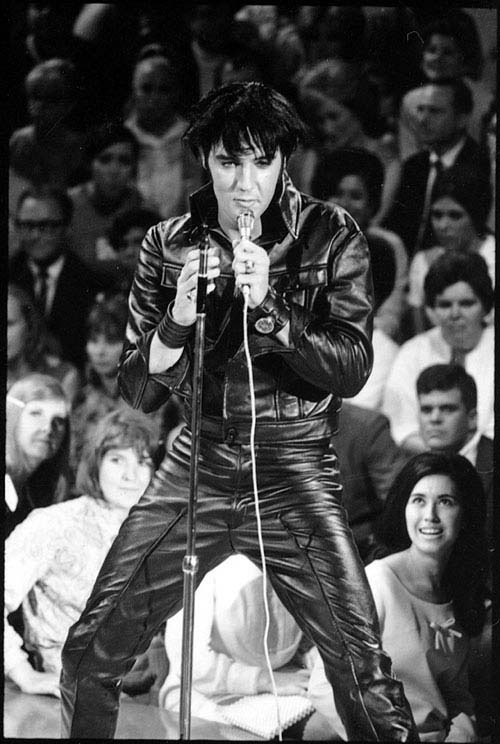 I think we were in shock, and also afraid if we sat on the stage, we would be told we had to leave when Elvis came out to sing...and then someone else would be in our seats...so, through shyness and this fear, we stayed where we were. Even so, we were very close to the stage! It was a small room! 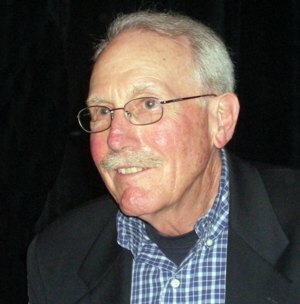 We had never met Bones Howe before and it was a total pleasure to talk with him at last. He and his wife were very easy to talk to, and very genuine. Both Steve Binder and Howe had their wives along and in fact Sherry Binder remembered us coming to their house a couple of times about 7 years ago. After 40 years, I guess that people's memory is not always clear, and there are bound to be discrepancies between individual memories of the events. Of course we all lose some old memories over the years... but I feel that this event - the Elvis '68 special at Burbank was an extremely important part of my life. I returned here from England because I learned I had tickets to this performance. A turning point in the direction of the rest of my life! This truly seemed that it was the closest I ever could get to seeing Elvis "record" - which was my life-long dream! I therefore like to surmise that there are probably more details I remember than people involved with working on the show itself, because to them it was A JOB! - one of many in their lives. They had other jobs...and went on to work with other famous people and had eventful careers. But for me, this was a true highlight of my LIFE! Another surprise was seeing Lance LeGault in the audience after all these years. He didn't however say anything although he was introduced as being in the audience. He only stood up in acknowledgment. We did however see him at the After Party reception but only to say "Hello" having met Lance a couple of times, about 15 years ago. The "After show" was a reception at the nearby Archlight Cinema lounge. Drinks and hor'dervres were served..and people mingled. Bones and Binder were there with their wives. Lance LeGault was there, too. Also in the audience and at the After Party, was Tanya Lemani - who was "Little Egypt in the "68 Special. Priscilla and Lisa Marie were not in attendance at the After Party - it was very crowded - probably not "safe" for them to be in such a crush of people. Finally I must note that Steve Binder asked that 3 people be remembered, who had been involved in the '68 Special, as sadly they had passed away. W. Earl Brown who passed away recently (he wrote "If I can Dream"). Claude Thompson - who was the male lead dancer in the "SAVED" production number, also choreographer and make-up artist on the '68 Special. 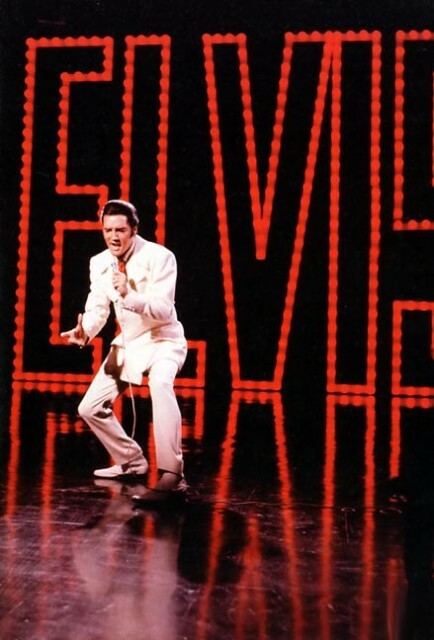 Bill Belew - the third person to sadly leave us was of course Elvis' costume designer. June 1968 - A true highlight of my LIFE! Copyright by EIN March 2008. ALL photographs & images by Paul Gansky - March 2008. 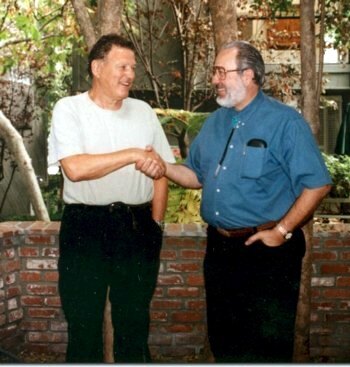 - Images can be reproduced elsewhere as long as Paul Gansky credit is noted. Click here to see Paul Gansky's Close-Up photos of the Memphis 30th Anniversary concert. 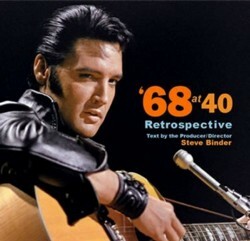 '68 At 40 Retrospective' book review: Joe Tunzi has teamed up with Elvis' 1968 TV Comeback producer Steve Binder to create a quality hard-backed book of 120 colour pages. The book, which features 8 chapters that examine all the different aspects of bringing this life-changing programme to air, is very stylish and beautifully laid-out. 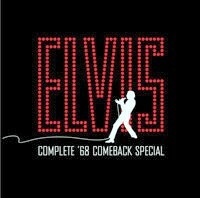 There is a real excitement in being able to study every stunning classic Elvis moment in detail and best of all are Steve Binder's recollections giving us yet more insights on this special event and all the tricky production decisions that he had to make a stand for. EIN's Piers Beagley checks outs JAT Productions best book so far. Click here for our detailed review and images.